When this card is Normal Summoned, select 1 Level 3 or lower Dragon-Type monster in your Graveyard and equip it to this card. This card gains ATK equal to the equipped card's ATK. During battle betw.. When this card is Normal Summoned, select 1 Level 3 or lower Dragon-Type monster in your Graveyard and equip it to this card. This card gains ATK equal to the equipped card's ATK. This card can atta.. When this card is Normal Summoned, select 1 Level 3 or lower Dragon-Type monster in your Graveyard and equip it to this card. This card gains ATK equal to the equipped card's ATK. When this card des..
By discarding this card from your hand to the Graveyard, negate 1 battle involving a "Cyber Ogre" on your side of the field, and it gains 2000 ATK until the end of its next battle. 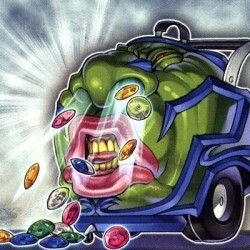 This effect can be..
Once per turn, during your Main Phase, you can select 1 Level 3 or lower monster on your opponent's side of the field and equip it to this card (Only 1 card at a time can be equipped due to this effec..
Once per turn, during your Main Phase, if this card was Special Summoned by the effect of "Allure Queen LV3", you can select 1 Level 5 or lower monster on your opponent's side of the field and equip i..
Once per turn, during your Main Phase, if this card was Special Summoned by the effect of "Allure Queen LV5", you can select 1 monster on your opponent's side of the field and equip it to this card. ..